Archbishop-designate William E. Lori of Baltimore has walked the halls of political power in the U.S. Capitol in Washington many times during the last several months, advocating for a renewed defense of religious freedom. As chairman of the U.S. bishops’ Ad Hoc Committee for Religious Freedom, the New Albany native has been one of the Church’s chief voices calling on President Barack Obama to rescind his administration’s mandate that nearly all employers provide free abortifacient, sterilization and contraception coverage to their employees even if they are opposed in conscience to these medicines and procedures. In being such a prominent public advocate for religious freedom, Archbishop-designate Lori is following in the footsteps of another son of New Albany, Cardinal Joseph E. Ritter. Nearly 50 years ago, Cardinal Ritter stood on the floor of St. Peter’s Basilica in Rome during the final session of the Second Vatican Council to persuade his brother bishops from around the world that religious liberty is part of the teaching of the Church. At the time, Cardinal Ritter was serving as the archbishop of St. Louis. He had previously led the Archdiocese of Indianapolis. 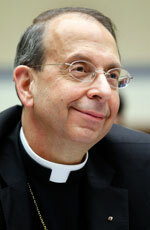 Archbishop-designate Lori was ordained a priest for the Archdiocese of Washington in 1977. For the past 10 years, he has served as the shepherd of the Bridgeport, Conn., diocese. On March 20, Pope Benedict XVI appointed him to lead the Archdiocese of Baltimore, the oldest diocese in the United States. He will be installed in Baltimore on May 16. Q. What’s it like for you to consider that, in many respects, you are following closely in the footsteps of Cardinal Ritter in providing leadership and service for the Church in our country? A. “Certainly, Cardinal Ritter was a great and visionary leader. The thought of following in his leadership and his vision is something that one prayerfully aspires to. Not his honors [as a cardinal], but his leadership. Q. The tie that binds you and him goes even deeper than your shared hometown. He was an advocate for religious freedom nearly half a century ago. And now you’ve taken up that cause today. A. “That is a wonderful connection, and one that is really humbling for me to consider. “What I’m really doing now is being true to that vision, which he and the whole Church set forward about the dignity of the human person, about the truth that religious liberty is a gift not bestowed by the state but given by God. Q. So are you saying that his advocacy for religious freedom in the 1960s was directly related to his earlier work against racism both here in the Archdiocese of Indianapolis and in St. Louis? Q. You’re not the first archbishop of Baltimore to have been born in the Archdiocese of Indianapolis. Archbishop William D. Borders was born in 1913 in Washington, Ind., which was then in the Diocese of Indianapolis. And the first bishop of Vincennes was Bishop Simon Bruté, who ministered in the Archdiocese of Baltimore and, particularly, at your alma mater, Mount St. Mary’s Seminary, before coming to Indiana. Do these connections between the Church in central and southern Indiana and the Archdiocese of Baltimore have special meaning for you as you look forward to beginning your leadership there? A. “They do. I knew Archbishop Borders because I served in Washington for so many years. I liked Archbishop Borders very, very much. So I immediately thought of that connection when I was appointed. And I made the connection as well between Bishop Bruté and Mount St. Mary’s, where I was a seminarian. The thought that someone who has a deep Maryland connection and a deep Indiana connection, and whose cause for sainthood is now proceeding [is special to me]. I feel that I have an additional friend who can pray for me as I begin my work in Baltimore. Q. How did the broader Catholic community in the New Albany Deanery contribute to the foundation of your life of faith and your priestly and, ultimately, episcopal vocation? A. “I was very blessed to grow up in a very strong parish, a growing parish and, at the time, a young parish—Our Lady of Perpetual Help. Father [Charles H.] Wagner, of happy memory, was working as hard as I’ve ever seen anyone work to build that parish and to strengthen it. “I was confirmed by Archbishop [Paul C.] Schulte. And it was really not too long after that confirmation that the thought of a priestly vocation occurred to me. “I was educated by the Franciscan sisters of Oldenburg. I remember very well Sister Mary Viator. She taught my father at the orphanage in Vincennes. She had him in the sixth grade, and taught me in the third grade. Well into the 1980s, my parents and I would visit with Sister Viator and Sister Mary William, who had been the principal and my eighth-grade teacher. “They had a big influence on me. “There were so many strong Catholic families. I was blessed by my mother and father in their strong faith. I think of Mr. and Mrs. Herman Hock, the parents of my good friend, David Hock. If you went there for dinner, you also knelt with the family to pray the rosary. “I think as well of Bud and Frances Oeffinger, who lived across the street from us on Indiana Avenue in New Albany. It was Mr. Oeffinger who had a bunch of us pile in the back of his station wagon, and we went down to Saint Meinrad. Q. How would you describe the effect of your parents and their example on the development of your own life of faith and your vocational discernment? A. “One of the first things that I must have come to know was how seriously my mom and dad took their faith. The rosary was very much a part of our life as was Sunday Mass. When Mom and Dad could do it, they were daily communicants. “The parish was very much at the heart of our life at home. There was no question that I would be sent to the Catholic elementary school at Our Lady of Perpetual Help. I was encouraged to serve [at Mass]. “When I first thought about having a priestly vocation, Mom and Dad very wisely didn’t push me and they didn’t pull me. “I have a brother with special needs. And their love for him, which is not always easy, influenced me greatly. I’m sure it played a role in my own life of faith, but also in my vocation as a priest. Talk about living out your vocation to love. Q. As your own vocation has unfolded over many years now, how has your gratitude for their love and guidance grown over the years, especially as they have been faithful to their own vocation for 65 years?